Sometimes you pick up a book that is so well written and so beautiful, reading it warms your heart. 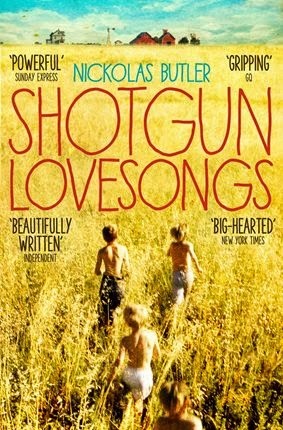 Shotgun Lovesongs by Nickolas Butler is definitely one of those books. Henry, Lee, Kip and Ronny grew up together in small-town Wisconsin. They now lead very different lives, but their shared childhood keeps them bonded. The group all come together for a wedding, and rivalries surface, truths are told and friendships are put at risk. Butler creates four layered characters, all of whom I absolutely loved for very different reasons. Together and apart, Henry, Lee, Kip and Ronny are sympathetic, likeable, full of depth and complicated in a way that male characters in books and television and film often aren't (at least in my experience). Of course, while I loved all four characters, I definitely had a favourite - Lee. I think it was his vulnerability that really spoke to me, because even though he's a famous singer, travelling the world and revered by everyone, Lee, out of all of his friends, is the one who needs the most. He needs that connection to his hometown, he needs his friends, he needs love. Shotgun Lovesongs is a wonderful love story between four friends. It's a great look at male friendship, and at the bonds that bind people together across years and many miles. It's tinged with nostalgia, of moments from a lifetime together. 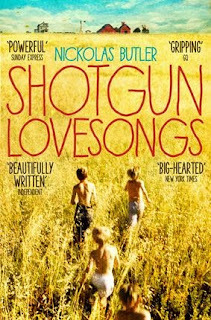 Reading Shotgun Lovesongs is a bit like sitting in a field on a warm summer evening - there's a slightly hazy edge to everything, and while there's a threat of a storm on the horizon, you feel welcomed and loved and safe. It might be a book just about friendship, but it's as addictive and all-consuming as any thriller or action film, and the stakes are much higher.